Maximize every moment in Madrid by combining two of its most iconic museums into one convenient tour. On this 5 to 5.5 hour semi-private tour, your expert guide will lead up to 8 guests to skip the lines at the Prado and Reina Sofia museums. These rich collections of both historical and modern European art are not to be missed. Start at the Prado, Spain’s response to the Louvre. One of the most visited sites in the world, the Prado is essential for any trip to Madrid. 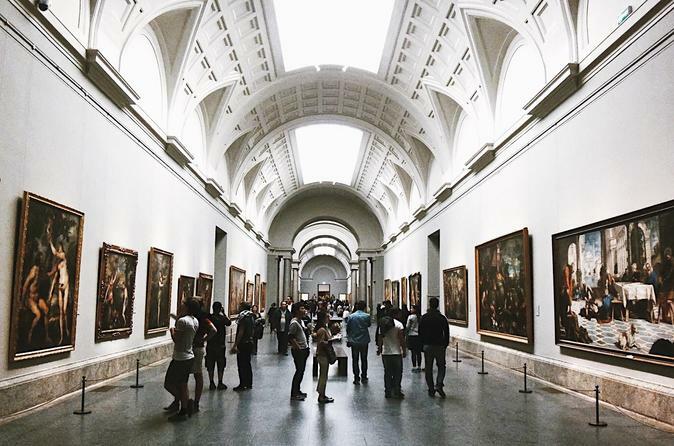 Housed in an 18th century neoclassical building, the Prado Museum displays thousands of works from its vast collection, spanning the 1200s to the 1900s. Some of the stand-out pieces include “Las Meninas” (The Maids of Honor), an inventive self-portrait by Spanish-born Velázquez, and “The Garden of Earthly Delights,” a triptych from Dutch painter Hieronymus Bosch. You’ll wander its hall as your expert guided reveals the stories and secrets behind works by Goya, Fra Angelico, El Greco, Rembrandt, and others. Explore the largest collection of Italian masterpieces outside of Italy in addition to a fine selection of prints and sculptures. Next, make your way to the Reina Sofia Museum, which houses an exquisite collection of Spanish modern and contemporary art. Part of a former hospital, the Reina Sofia became gallery space for 20th century art back in the 1990s. On this tour, your guide will introduce you to the different artistic movements showcased here, including abstractionism, cubism, surrealism, and modernism. You’ll come face to face with works by the iconic Pablo Picasso, including his world-changing painting, “Guernica.” You’ll browse works by Joan Miró, like “The Man with a Pipe,” and Salvador Dali’s “Face of the Great Masturbator,” learning about the techniques and strategies they used to create their oftentimes quirky works of art. You’ll discover all about the social and political movements that shaped these artists and their work, including the Spanish Civil War. You’ll leave with a richer understanding of 20th century Spain, allowing you to wander confidently through one of the world’s largest contemporary art collections.